I am a huge fan of following the Microsoft Developer Network (MSDN) Blogs RSS Feed. This feed lets me see every post made by anyone who blogs on the MSDN network. A lot of the content is very technical in nature and many include lots of coding etc. however, the reason I follow the feed is because there are some real jewels that come out on software, features, etc. Well this post that I am about to share with you came from the MSDN Blog of Tim Omta who is a Microsoft Field Consultant. 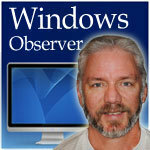 Windows Observer Microsoft Word, Windows Observer. permalink.